XTAR, LLC, the first U.S. commercial provider of services in the X-band frequency, announced that the company has been awarded a Future COMSATCOM Services Acquisition (FCSA) Schedule-70 Special Identification Number (SIN) for transponded services. The award gives XTAR’s government users an additional option for acquiring commercially-available, high-speed X-band capacity. It also reinforces XTAR’s ability to serve the government’s varied mission requirements for both bandwidth-only and value-added solutions through its relationships with resellers. The DISA/GSA FCSA transponder services SIN pertains to leasing short- and long-term satellite bandwidth. XTAR’s SIN award covers a period of five years, with two five-year renewal options. The U.S. government has awarded several task orders for X-band to support the warfighter and anticipates the number and frequency of such task orders to increase under FCSA as demand for space segment increases. This demand is driven by applications requiring greater bandwidth, including Airborne Intelligence, Surveillance and Reconnaissance (AISR). XTAR-EUR, located at 29 degrees East, entered service in April 2005. It carries 12, 100W wideband X-band transponders in both right- and left-hand circular polarization. This extremely flexible payload makes it ideal for X-band services from Eastern Brazil and the Atlantic Ocean, across Europe, Africa, the Middle East, and South East Asia. The satellite covers a large geographic area with its two global beams, one fixed and four steerable beams that can be repointed within the satellite’s coverage area. 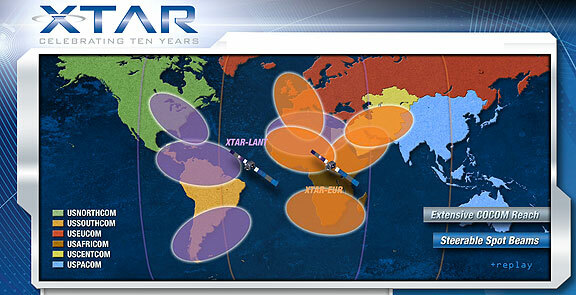 This flexibility, combined with coverage of Africa and North- and South America by XTAR’s second payload, XTAR-LANT, adds tremendous capabilities for government and military users across most of the globe. As the first commercial provider of services in the X-band frequency, XTAR is exclusively dedicated to serving the long-haul communications needs of U.S. and Allied military and government organizations. Its two owned and operated payloads provide 4 GB of X-band capacity from Denver east to Singapore. XTAR is committed to the success of all its customers based on providing a highly responsive commercial and operational experience designed to meet or exceed the unique mission requirements of governments around the world.